“95% of lifestyle diseases are due to unhealthy diet and lack of exercise.” – Dr. Saravanan. 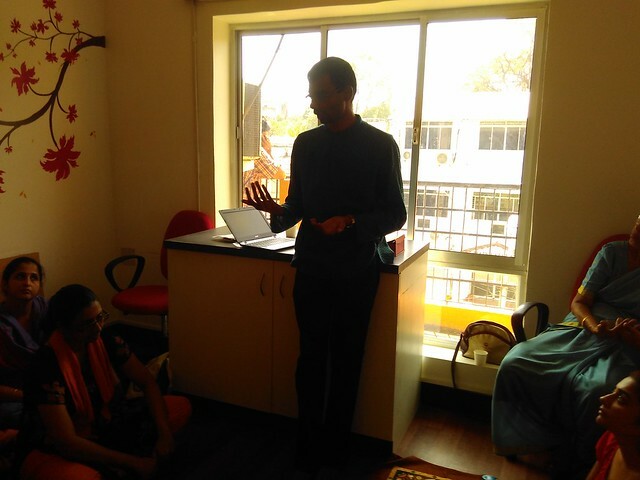 Yesterday, I attended a talk by Dr. Saravanan of Sharan India @ Meal ‘N’ Heal, Chennai. This was a 1.5 hour presentation on why switching over to plant-based and organic/healthy diet is important to fight lifestyle diseases like diabetics, hypertension, arthritis, auto-immune diseases, etc. He told us that both animal protein and milk protein are unhealthy and addictive. That maybe the reason why we find it difficult to stop eating/drinking milk-based products. He said milk, sugar, maida, refined salt are all white poisons. His points were similar to what was mentioned at the World Veg Fest that I attended earlier. He recommends following a plant-based diet with a good mix of fruits, vegetables, legumes and whole grains. Our food should be colorful, like a rainbow! Eating fruits directly along with the peel is better than drinking fruit juices as the peel that contains important enzymes needed to digest the fruit sugars are discarded in juices. Legumes provide a lot of fiber that makes the body healthy. Whole grains are better than refined/processed grains as the nutrients on the top layers are retained. After this talk, I am inspired to skip milk-based Tea that I drink twice a day. I have switched over to green tea and vilvam juice 🙂 However, I am not yet convinced to skip curd and ghee as I believe they are healthy. I drank the peanut curd provided to us in the meet and it was good – I need to find out how to make it! The issue is, it’s very difficult to avoid milk that goes into our body indirectly. Biscuits, cakes, ice creams, cheese-based snacks, sweets, coffee, tea, etc. all contain milk! But now I am aware, so will reduce eating them slowly. If you avoid meat & diary products totally, do remember that you may need to take Vitamin B12 and D supplements. SHARAN India is coming up with a 1-day workshop on ‘Reversing Diabetics and Hypertension’ on 27th March, 2016. Click on the above link for details and see if you or someone you know may want to attend the program. That’s why if we attend sessions like these, we might be inspired to control ourselves better in the future. Yes, it is difficult to avoid milk, the best way is to avoid all processed foods and go vegan. Wish I knew about this talk, will be checking out on his next one now!! Thanks for the write up. The issue is, most of the food available in the supermarkets today is processed! I don’t take coffee or tea now for the past couple of years. Only green tea. But stopping curd is very difficult…Curd rice is a must in the afternoon, for me. I can skip at other times. I dont like juices, much but fruits, yes! Am using lots of organic vegetables nowadays. Great maami. I am with you on the curd rice part – I think it’s a healthy food while at home and a light food while traveling. Very Interesting. I agree it is tough to give up something that we are used to for a long time. It’s not so tough if you consider the (poor) quality of milk available nowadays! Life without my coffee – unimaginable! But I do see your point and agree to it! How can we ignore milk products esp Palkova, Rose Milk, Icecreams, Masala Tea, IceMoore, filter coffee..very hard .. I often thought how people are going vegan!! Absolutely! Eating healthy keep away the illness and disease, but avoiding milk product is not possible and for me doctors suggest to take milk for calcium as I am wheelchair bound and not much active, bone are weaker. I also reduced taking coffee and tea and shifted to D-protein. If you need to take milk for medical reasons, it maybe better you continue. But ppl. tell me that there are alternate and better sources to obtain calcium from certain plant-based sources. Try to explore them too.